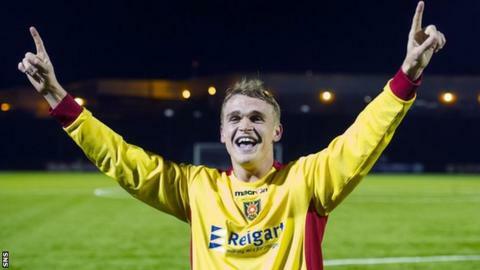 Albion Rovers goal hero Gary Phillips says nothing will compare to the feeling of dumping Motherwell out of the Scottish Cup. Phillips struck a last-minute left-foot shot past Gunnar Nielson to seal a stunning 1-0 victory over the Steelmen. Rovers sit second bottom of League Two but pulled off the shock of the fourth round by beating the Premiership side. "Without a doubt it's the best," elated winger Phillips told BBC Scotland. "You can't compare it." The tie had been moved away from Rovers' spiritual home of Cliftonhill in favour of Hamilton Academical's larger New Douglas Park. Motherwell's fans made up the majority of the 2,950 crowd, but Phillips revealed it was no away game for him, because he works at the stadium. The transfer window is just around the corner, so it could be the difference between me getting the striker I need and the chairman not wanting to talk to me about it. "I actually work up the stairs in Hamilton as a personal trainer, so I'm here every day," he said. "I was looking forward to getting a break from the place. But, if it's going to be like that, I'll take it every day. "Obviously it would have been nice to have had it at Cliftonhill, but we know the circumstances are what they are. "The atmosphere in the ground was great, so you couldn't really ask for much better. "It set the tone for the whole game, even from the minute all the fans walked in." Rovers manager James Ward was in no doubt that his side deserved to take the scalp of Lanarkshire rivals Motherwell. "We're delighted and, based on the desire and endeavour we showed out there, it's fully deserved," he said. "It's obviously the biggest result I've had so far, but it also gives us a great boost in terms of confidence because we've had a bit of a rollercoaster ride after a good start to the season." Rovers now look forward to Monday's draw for the last 16, with Ward admitting he wants another big-name opponent. "We'll take anyone," he added. "For our fans, obviously to get to this round, the bigger the team the better. "It's massive. It could make a major contribution to our season. "The transfer window is just around the corner, so it could be the difference between me getting the striker I need and want and the chairman not wanting to talk to me about it."